Are you an avid bird watcher? A stargazer? 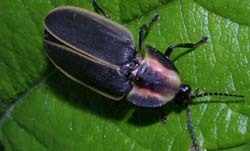 A firefly follower? Or just someone who likes walks in the park? Taking part in Citizen Science Projects is an easy way for anyone who enjoys nature to contribute to scientific studies on a wide range of topics. Whether your interest is in climate change, birds, bugs, or something else Citizen Science Projects are accessible to nature lovers with any level of knowledge. Many projects simply ask you to report certain rare sightings, while others ask you to monitor certain events, for example when flowers bloom or birds arrive. There are many options to chose from, and information collected from these projects can have a big impact on local or national conservation efforts. Do you frequently visit National Wildlife Refuges? 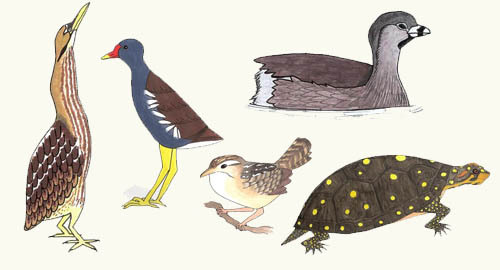 The US Fish and Wildlife Service keeps a log of rare species seen on refuge lands. Keep an eye out on your next walk. Your information will help us record rare species sightings and report information to other agencies. Illustrations by local high school student Sohini Marjadi. Participating NWRs include Assabet River, Great Meadows, Oxbow, Monomoy, Massasoit, Mashpee, Nantucket, and Nomans Land Island. If you see any of these species on one of the listed refuges: Please contact the refuge Biological Staff at 978-443-4661 x23, 37, or 24, or email a report to Eileen_McGourty@fws.gov. Try to take down the location, time, and date and if possible snap a photo. Please include your contact information in the report so that we can follow up. If you see any off these species off of the listed refuges: report your sighting to MassWildlife’s Natural Heritage and Endangered Species Program. Find out more at www.mass.gov. Join Refuge Staff in their ambitious project to repopulate the Assabet River NWR with Blandings Turtles relocated to Assabet from other local refuges. A small number of assistants are needed to help with the research running from May through October. Preference will be given to volunteers who can commit to assisting at least 1 day / week for at least an 8-week period. No special skills are needed. Contact Stephanie Koch at 978.443.4661, x24 or Stephanie_Koch@fws.gov. The local population of Blanding's Turtles at Great Meadows NWR, Concord, is the third largest population known in all of New England but it has declined by more than 50% in the past 30 years. Blanding’s turtle nests are often inadvertently destroyed and adults, especially nesting females, have been killed by cars when crossing roads. Without our help, these unique turtles, many of whom are over 60 years old, will soon be gone from Concord. Report any sightings of Blanding’s turtles at Great Meadows (see below). Allow these rare turtles to nest in your yard. Help turtles cross the road, when it's safe to do so. For more information on reporting turtle sightings and on indentifying a Blanding's Turtle, see here. Invasive plants species are species which have naturalized in an area where they are not native to and cause disruption and damage to the ecosystem and the native plants and animals by displacing them or by significantly altering their habitat. 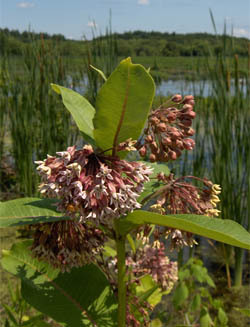 The Fish and Wildlife Service have a three part program to control and eradicate these plants – Early detection, Mapping and Removal. The work parties announced below are for removal. Dates for work invasive species mapping and removal work parties are posted here. Refuge staff is helping with the Mass Audobon Breeding Bird Atlass (see below for details) and the National Audobon Society's Christmas Bird Count (see below for details). To help the staff with these projects contact Eileen McGourty at 978.443.4661, x37 or Eileen_McGourty@fws.gov for the Christmas Bird Count or Stephanie Koch at 978.443.4661, x24 or Stephanie_Koch@fws.gov to help wth the Breeding Bird Atlas. Citizen Science projects you can help with can be found as near your own backyard and and as far away as the Milky Way. Here's a selection of Citizen Science projects you can help with. Citizen scientists are needed to monitor when plants and trees bud or bloom in the spring. The data collected with help scientists who are studying the effect of climate change on plant growing seasons. Find out more at www.budbhurst.org. Rusty blackbird populations have plummeted as much as 85-98% over the past decades. The Cornell Lab of Ornithology is currently tracking Rusty blackbird populations and your sightings would be valuable to their work. If you see Rusty Black Bird or would like more information on the project log on to report your sighting! Find out more at www.ebird.com. Ebird is also a great resource for bird watchers to log sightings and find out about current avian research. Watch baby birds to help scientists at the Cornell Lab of Ornithology track reproductive success of North American Breeding Birds. The website will guide you through everything you need to know, and you may be lucky enough to see the eggs hatch. Find out more at www.nestwatch.org. 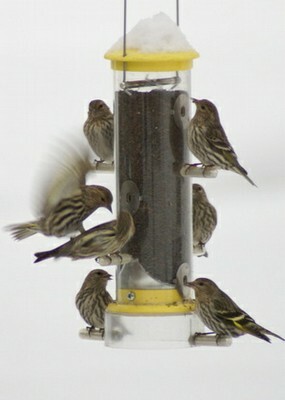 Enjoy bird watching even in the colder months by collecting data for this winter-long survey of bird feeder visitors. The data from FeederWatch is often published in scientific journals and helps scientists study, among other things, long term trends in bird populations. Find out more at www.birds.cornell.edu/pfw/. Record sightings to help Mass Audobon map breeding birds in the area. Fieldwork for Breeding Bird Atlas 2 began in April of 2007, more than 25 years following Mass Audubon's organization of Breeding Bird Atlas 1 in 1974. Atlas 1 was the first statewide attempt to systematically map the status of breeding birds. Completion of the five-year Atlas 2 project may reveal changes or trends in Massachusetts bird populations and the data will be valuable in providing scientific support for bird conservation in the state. Find out more at www.massaudubon.org. Do you have owls in your neighborhood? Have you heard or seen an owl? Mass Audubon needs help mapping these elusive nocturnal birds for the Breeding Bird Atlas 2. For help in your owl search, the Audubon website provides links to access recordings and identification information. Find out more at www.massaudubon.org/report-a-bird-sighting. At your next barbeque keep an eye out for fireflies. These flashy insects seem to be disappearing from summer nights. Boston’s Museum of Science is collaborating with researchers from Tufts University and Fitchburg State College to monitor the status of fireflies in the area, specifically their geographic distribution, summer activities, and reaction to human activities. Report firefly sightings or find out more about the project at www.mos.org/fireflywatch/home. Help count Massachusetts’ local birds – either as part of a field team or by watching your feeder from your window. The data collected from CBCs helps scientists to evaluate the long-term health and status of North American Bird populations. Information for the 110th annual CBC will be available on the website starting in November of 2009. Visit the website to find out about previous CBCs and how to get involved. Find out more at www.audobon.org/bird/cbc. Contribute to the Discover Life online encyclopedia of life, which now boasts 1,289,649 species pages. By documenting species online and making information accessible, the website creators hope to provide everyday citizens with the information to participate in conservation efforts. To find out how to help, or to learn about new species, visit the website. Find out more at www.discoverlife.org. Do you enjoy the night sky? Join more than 31,000 other Citizen Scientists from over 60 countries for the annual Great World Wide Star Count. Your observations will help create maps of current patterns. Visit the website to find out how to get involved, view results of the previous counts, and learn more about astronomy. Find out more at www.windows.ucar.edu/citizen_science/starcount.